Saturday morning, Ruth just didn't feel right. 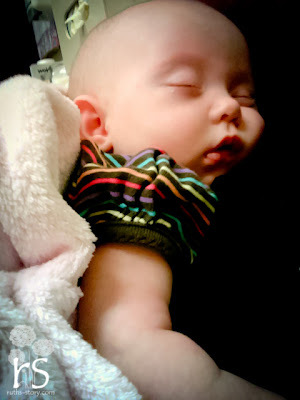 She was too sleepy, too fussy, and felt warm (even tho the thermometer didn't show anything at that point). I tried to brush it off as maybe just gas or tummy troubles, but that didn't explain the sleepiness. A little later in the day, I took her temp again and this time it came back at 99.9. Since she showed no signs of a cold, I was worried about her having a UTI, since her urologist told us any time she runs fever to check for one. I cathed her (sterile technique so I could use the same urine to send off to the lab). The last time I suspected a UTI I was able to take her into our pediatrician, and I ended up doing her cath for the urine sample anyway because the nurse had difficulties, so this time I felt getting it at home with less germs would be best. Unfortunately this of course, happened on a weekend. Her urine was cloudy, so I took her in to the Urgent Care down the road. The doctor there checked her over, did a quick test on her urine (which showed several things indicative of infection), and sent it off for culture. They started her on antibiotics. She was pretty pitiful. Monday morning I called her pediatrician and also urology over at Scottish Rite. I ended up taking her in to see her pediatrician since she was only seen by urgent care, and they felt everything was ok. The urologist wasn't concerned about one UTI, especially since her fever never got super high, so we will continue to do nothing. She still has her DMSA test next month to test for any kidney damage. That will tell us the most about what her treatment should be, if we can continue to do nothing, or if we need to start back on the meds/cathing routine. I hope you get some answers! I know Madi had one infection, possibly, but after I talked to her urologist, he may not have even treated her for it. She was having no symptoms (when they were doing a urodinamics they noticed her urine was cloudy) and I guess the urologist expects bacteria, so he only treats the infection if it is a specific bacteria that grows. Anyhow, this is all new to me too! I hope you get it all figured out! Poor girl! Hope you get answers on this. Ruth is so darn cute, and getting cuter every day. Oh dang. Sorry Ruth had to go through another UTI! We're in the same boat with the no cathing experiment. Here's to hoping it goes well and no kidney issues! p.s. Gorgeous photography. I always notice it. You have a gift! I wish I could take classes from you! I am sorry about the UTI, Ruth is darling. I was just watching your video from your San Fran experience. It is incredible to watch. It is great to read other blogs who also have had pre-natal surgery. It is truly a experience that no one can comprehend unless you have done it. So hard but so worth it and I would do it again in a heart beat.